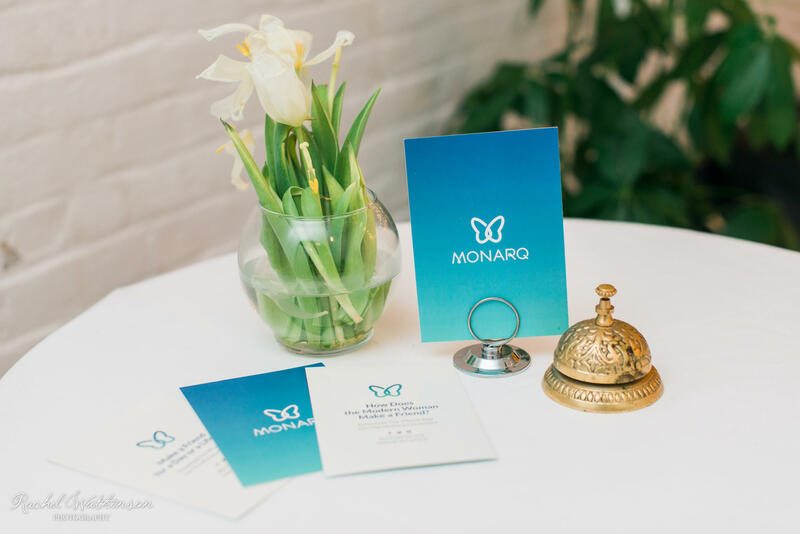 Monarq is excited to host a unique evening for Women Founders in all stages of entrepreneurship. Three prominent investors Adam Quinton, Mee-Jung Jang and Sapna Shah, equally passionate about female founded businesses will take center stage to have an in depth conversation to discuss, breakdown and dive into all your questions about growing your business through outside funding. ﻿Join us for conversation and networking with other investors, press & female founders over drinks and snacks at the beautiful Steelcase Offices. Sign up HERE to be the first to know about the next one. Exhibit C. is a fresh space celebrating all that is food in the world. We gather good people over good food to spark friendships and new ideas. Founded by haute vegetable chef Daphne Cheng, it's a place to experiment with food and culture. Visit exhibitc.co to learn more about our many deliciously interesting classes, dinner salons, and events. Giraffe Advisors, Sapna makes angel and early-stage seed investments in retail, fashion and consumer start-ups and offers advisory services to early-stage companies. Sapna is a member of the Board of Directors of New York Angels. Previously, Sapna co-founded Retail Eye Partners, and a menswear e-commerce retailer, Mind the Chap. Sapna held executive strategy roles at Linens & Things, Inc., Ann Taylor, and spent time at Gap, Inc. Previous to her career in retail, Sapna worked in investment banking and credit at various banks. Adam is the CEO & Founder of Lucas Point Ventures and an active investor in early stage companies. He serves on the Board of Directors and Advisory Boards of several companies. His current investments include The Muse, Rapt Media, VenueBook, Hire an Esquire, Pinks and Greens, Validately and Snaps. In 2014 he was named one of the 25 Angel Investors you need to know in New York by AlleyWatch as well as one of 100 Tech Influencers You Need to Know. He is and member of and/or advisor to several angel groups (including 37 Angels and Astia Angel) as well as Women's Startup Lab and Mergelane. Mee-Jung is the co-founder and director of Jefferson Investors, a seed stage angel fund. Before Jefferson Investors, Mee-Jung was the founder and CEO of a tech startup called Voncierge. She has also worked as a corporate attorney at Cleary Gottlieb and as a quant hedge fund analyst at Geode Capital Management. She is the author of the book Harvard vs. Seoul National University, published in South Korea. Mee-Jung has a bachelor’s degree in computer science and economics from Harvard University and a J.D. from Yale Law School. She is a current fellow of the Kauffman Fellows Program. Fiverr® is the world's largest marketplace for digital services. Our mission is to shape the future of work, every day. "I was surprised by the level of connection, sharing, and vulnerability among this group of women who are willing to support and assist. The founders of Monarq have set an amazing tone and example of women helping women"
"3 Reasons NOT To Raise Angel Capital"
"10 Startup Fundraising Tips From Golden Seeds Managing Directors"
"Five Red Flags To Avoid When Pitching Investors"
"Focused, Fearless And Frank Female Founder"
"Resources For Financing For Women Owned Startups"
"5 Qualities That Make Your Company Ready For Angel Investment"
"What Is Possible If “I Do” - 5 Steps To Fundraising Success"
"5 Keys To Fundraising Success For Women Founders"
Our mission at Monarq is to help women start, fund and grow their businesses. Join us for monthly curated Dinners, Breakfasts, Panels & Workshops connecting influential investors & press with active & aspiring women entrepreneurs in NYC. WeWork Labs is New York's premier shared workspace dedicated to early stage startup companies. We provide startups with the tools, community, and connections they need to grow their businesses successfully. As an incubator program, WeWork Labs guides entrepreneurs through the initial stages of starting a company, offering curated partnerships, events like Demo Days and UX workshops, introductions to VCs, and mentorship opportunities in order to proactively facilitate their growth. Apply here! Tickets are nonrefundable. Looking forward to seeing you there!